Home > SPORTS > Sports in Nepal > Another proud moment for the Sandeep Lamichhane ! 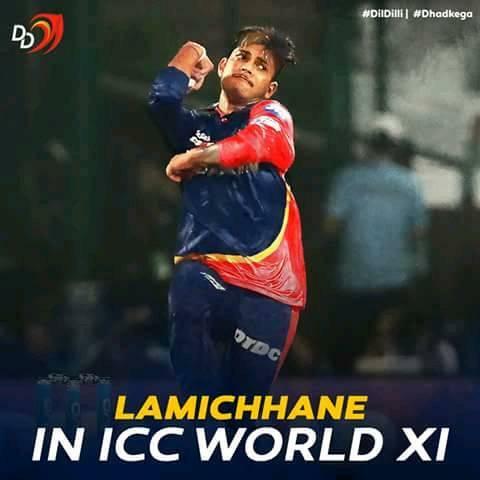 Another proud moment for the Sandeep Lamichhane ! Congratulations to Sandeep Lamichhane on being added to the ICC - International Cricket Council World XI squad to take on West Indies on 31 May at Lord's Cricket Ground! Another proud moment for the teenage sensation! SOME VALUABLE TWEET TO SANDEEP LAMICHHANE ! If “A billion dreams” is a fitting tag line for @sachin_rt I’m sure “A million dreams” will fit our own champion @IamSandeep25 very aptly.thank u @IamSandeep25 @MClarke23 @DelhiDaredevils ..🙏🏼🙏🏼🙏🏼.. what a feeling😀😀😀😇😇😇..
Sandeep ले बलिङ गर्दा मुखबाट नेपाल नेपाल पो निस्किन्छ हौ। congratulations brother for your 1st wicket. wat a feeling just seeing you play wonderful cricket.